First I prepared the filling. In a small bowl whisk together cornstarch and orange juice until the cornstarch is dissolved and set aside. 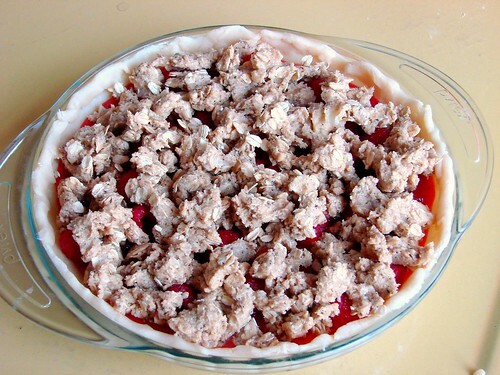 Wash the rhubarb and trim off the edges. Cut rhubarb into 1/2-inch slices so that you have enough to fill 3 cups. In a medium saucepan stir together rhubarb, sugar, cinnamon, ginger and vanilla. Cook over the mixture on moderate heat, stirring constantly, until the sugar is melted and bubbly. Add cornstarch mixture to rhubarb mixture and bring to a boil, stirring constantly. 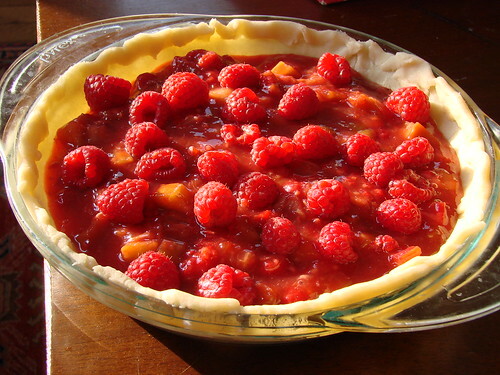 When rhubarb mixture reaches a boil stir in 1 1/2 cups of raspberries and continue simmering and stirring until rhubarb mixture becomes thick Then transfer mixture to a medium bowl, cover and chill in the refrigerator for at least 30 minutes or until the mixture is cold. As much as I like pie, I'm not a piemaster by any stretch of the imagination. I've yet to perfect my own pie standard pie crust recipe. For this particular pie I worked from Alton Brown's Pie Crust Recipe. I have to tip my hat to Alton. The recipe was easy really easy to work with. I followed his instructions up through the chilling part. Then to be honest the steps felt a little convoluted to me. I'm the type of person that learns by doing, so I said screw it and rolled out the pie as I normally would--when the dough was chilled I rolled it out between two pieces of plastic wrap to keep it from sticking. Then I peeled off one side of the plastic wrap and center that side of the dough in the pie plate then remove the other sheet of plastic wrap. Tada! Add brown sugar, flour and chai tea to food processor. Cut the unsalted butter into 1 tablespoon chunks and toss into food processor. Pulse mixture several times then add in oatmeal in three stages pulsing a couple times in between until mixture is crumbly. Top the pie with the crumble. 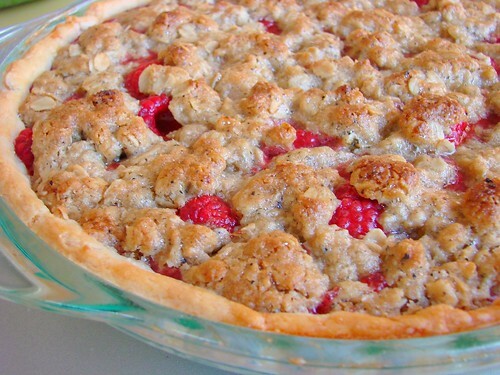 Bake pie on a baking sheet in middle of oven for 25-35 minutes or until the crust cooked through and both crust and crumb topping are golden brown. Cool pie on a rack at least 1 hour to set filling. Wow, that Chai oatmeal topping sounds phenomenal!!! This looks so good! What was the verdict upon tasting?